I went to see SHORT+SWEET on Thursday night. 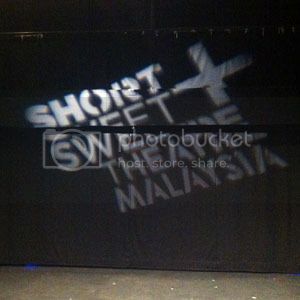 Short+Sweet is the biggest short play festival in the world. First produced at the Newtown Theatre in Sydney, Australia in 2002. This year happening in Kuala Lumpur AND Penang with a BRAND NEW category: STAND-UP COMEDY! The Festival will mark its 5th year in two most prestigious theatre establishment in the country, The Kuala Lumpur Performing Arts Centre –klpac and Performing Arts Centre of Penang (penangpac). Blind girl auditions for a part in a play. Away from , away from . It was ok. One actor played the three roles – essentially three monologues. I thought the actor did well as the farmer, but faltered more as the son and the miner. Way too manic, though I think the script itself was all right. The problem was the direction and the costume choices. Two little girls play together in the way little children do – getting into fights one minute, but making up the next. Pretty good, all things considered. I didn’t much like all the screaming, but they were suppoesd to be little kids so I guess that was inevitable. Very well-acted though. … I really don’t know what the point of this was? A good idea, but I felt it was a bit too long. And that dance at the beginning was a puzzle. I recognised the music as being “Dola Re Dola” from the film Devdas, but I’m not sure what the point of it really was. Was it to tell the audience that the two guys were supposed to be from India? If so, that was really unnecessary. The accents they used were enough. That description… didn’t seem to have anything to do with the actual skit. It turned out to be two guys rehearsing a script. I suppose the point of it at the end was that one guy was the “martyr” type – thinking that he’s sacrificing himself for everyone else and so on. Not too sure though. I was kind of confused by this too. A teenager confesses that her perfect life really isn’t so perfect at all. Very good acting, but also very gloomy monologue with odd shifts of position around the stage. Two people meet on the train and small talk ensues. This got my vote for the Audience Choice Award. Brisk, easy to understand, humorous. The only one that I truly enjoyed watching. A husband takes his insomniac wife for a holiday, hoping that she’ll get some sleep at last. Doesn’t happen. Not bad, but quite grim. The husband’s tenderness was quite convincing – when the audience collectively reacts the same way to a scene (“awwwww~”), you know you’ve hit the mark with both script and acting in that scene at least. Overall it was a good effort. I thought the acting was in general far better than the scripts. I’m not fond of depressing stuff in general so having 8 that were on the really serious and/or grim side was not really to my liking. Of the non-grim ones, the first was too crazy, the second was pointless and the third was just right. So I only really liked Small Talk Really Stinks but I think it was clear that everyone worked really hard and it shows. Nice to see that there’s quite a bit of acting skill around. Now we just need to improve the writing and directing part.